In the search of Malaysian Airplane MH370 i found the above image in Google maps south of Chatham Island (formerly alternatively known as Rekohu or Wharekauri), New Zealand in the South Pacific Sea. Im trying to find more info and the exact imagery date of the image. The google map is copyrighted 2014 by NASA TerraMetrics and DigitalGlobal. The watermarks on the image subject area say © 2013 Google. How do you find the date of a google image? If you enable the 'Status Bar' option under View menu then imagery dates (if available) will appear in status bar that shows at bottom of the map window in Google Earth. Dates are approximate. Sometimes dates are when the imagery was processed as opposed to when it was captured so you could have an image with Earth imagery see related link below to article. I need the exact date of an aerial photo. The time bar and the picture date differ. How can I know the exact date? Is there any way to tell the exact date of the current Google Map for a given location? The images in Google Earth (and Google Maps) are updated on a continuous basis. It's hard to say exactly when an area will be updated because some areas may be updated more frequently than others (just because that data is more readily available). While most images are no more than 3 years old in high resolution areas, low resolution imagery in some areas may be older. When high-res or newer imagery is not available, the base map used in Google Earth is a circa 2000 TerraMetrics/NASA 15 meter resolution base imagery. It takes months of post processing new imagery before they go online so bulk updates usually happen about every 2-3 weeks. Google Earth and Google Maps share the same backend satellite image database and are updated together. Why are newer images sometimes found in Historical Imagery? Newer imagery is sometimes available in 'Historical Imagery', which can be enabled from the View menu option in Google Earth. Sometimes older images are actually of better quality than new images (i.e. there might be a huge cloud over a certain area which encourages using theolder, clearer image). This feature is not available in Google Maps. Where was Google Earth imagery last updated? If you want to see where Google Earth (and Google Maps) imagery was last updated either check out the Google Earth Blog for update announcements or simply click on the 'Google Earth Imagery Updates' link Due to overwhelming demand when a given area will be updated Google has created a new e-mail notification service. Check out 'Follow Your World' in related links below. Daylight Saving Time DST ends on zondag, 6 april 2014, 03:45 local daylight time. DST starts on zondag, 28 september 2014, 02:45 local standard time. Aviation Safety Network records indicate that at least 88 passenger, corporate, cargo, and military transport aircraft went missing without a trace since 1948. 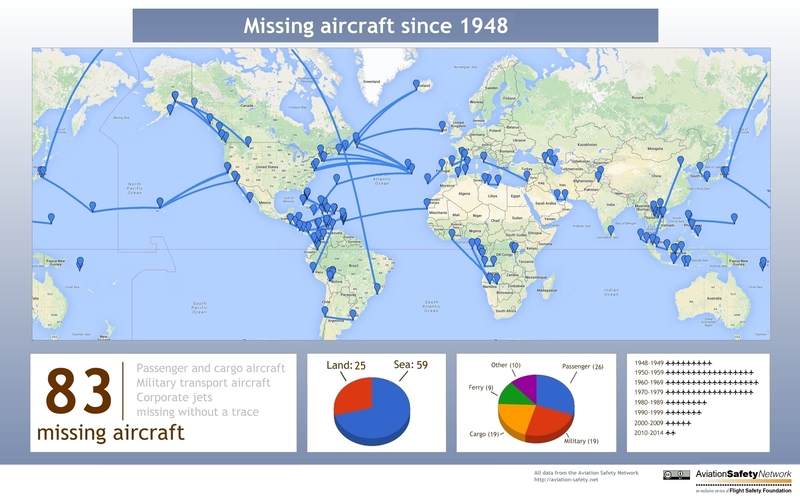 From the extensive ASN accident database, a list was compiled detailing 88 cases in which a passenger, corporate, cargo or military transport airplane went missing without a trace. In these cases not a single piece of wreckage, oil slick or body has been found. Update March 18: added DC-3 that went missing over Mediterranean Sea in 1981, changing total from 87 to 88.
a Whale Tail, an underwater Volcano, a Rock, an Optical Illusion? Humpback whales migrate each year to winter breeding grounds near islands and shallow banks in the tropical waters of Oceania (South Pacific) after feeding during summer in waters near the Antarctic. The long black and white tail fin, which can be up to a third of body length. A rock creating an optical illusion seems possible (see close-up below), tho does it explain the trail of about 4515.4 ft (1.3763km) from North-East to South-West and the far stretching ripples? * The trail behind the subject goes from North-East to South-West. 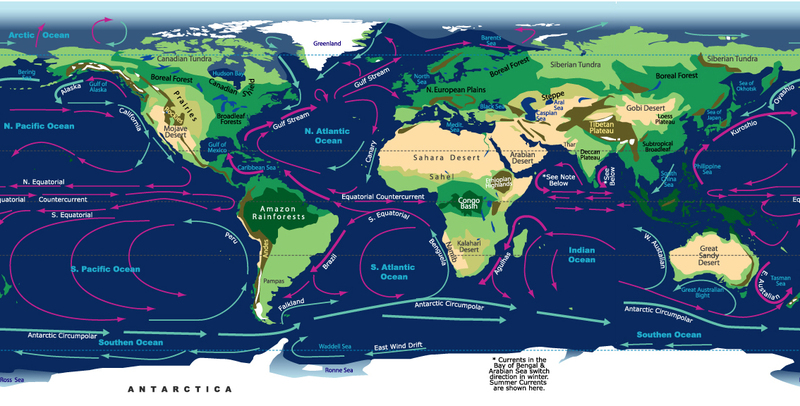 * The water wave appears to come from behind (North-East to South-West) instead of from the front side (South-East to North-West), which is the opposit of the ocean surface currents. * South-East of Chatham Island is Pitt Island, surrounded by many rocks to take for example. Non of them has a trail like the subject in the image. * The above makes it unlikely to be a rock. New Zealand consists of two large islands, North Island (113729km 2) and South Island (150437km 2), and two smaller islands, Stewart Island (1680km 2) and the Chatham Islands (970km 2). There are approximately 700 other small islands and islets, mostly within 50km of the main islands. The islands extend across 1500km of ocean from 34° to 47° south. The highest point is Mt Cook (Aoraki) in the South Island at 3754m. These islands developed on part of an extensive submarine plateau composed of continental crust (collectively named Zealandia) totalling 1.7 million km 2 , an extension of the islands stretching from the Campbell Plateau to the southeast, and the Chatham Rise in the east, to the Challenger Plateau to the west and New Caledonia in the north. Multibeam bathymetric surveys east of the South Island of New Zealand yield images of submarine volcanoes and pockmarks west of Urry Knolls on the Chatham Rise, and evidence of submarine erosion on the southern margin of the Chatham Rise. Among numerous volcanic cones, diameters of the largest reach c. 2000 m, and some stand as high as 400 m above the surrounding seafloor. The tops of most of the volcanic cones are flat, with hints of craters, and some with asymmetric shapes may show flank collapses. There are hints of both northeast–southwest and northwest–southeast alignments of volcanoes, but no associated faulting is apparent. Near and to the west of these volcanoes, huge pockmarks, some more than c. 1 km in diameter, disrupt bottom topography. Pockmarks in this region seem to be confined to seafloor shallower than c. 1200 m, but we see evidence of deeper pockmarks at water depths of up to 2100 m on profiles crossing the Bounty Trough. The pockmark field on the Chatham Rise seems to be bounded on the south by a trough at almost 1200 m depth; like others, we assume that contour currents have eroded the margin and created the trough. * Volcanic cones are among the simplest volcanic formations. They are built by ejecta from a volcanic vent , piling up around the vent in the shape of a cone with a central crater. Volcanic cones are of different types, depending upon the nature and size of the fragments ejected during the eruption. Types typically differentiated are spatter cones , ash cones , tuff cones , and cinder cones . * The water wave appears to come from behind (North-East to South-West) instead of from the front side (South-East to North-West). * Pockmarks are craters in the seabed caused by fluids (gas and liquids) erupting and streaming through the sediments. Could this explain what we see in the google image and the trail of about 4515.4 ft (1.3763km) from North-East to South-West and the far stretching ripples?